The concept of phage display is based on insertion of random oligonucleotides at an appropriate location within a structural gene of a bacteriophage. The resulting phage will constitute a library of random peptides displayed on the surface of the bacteriophages, with the encoding genotype packaged within each phage particle. Using a phagemid/helper phage system, the random peptides are interspersed between wild-type coat proteins. Libraries of phage-expressed peptides may be used to search for novel peptide ligands to target proteins. 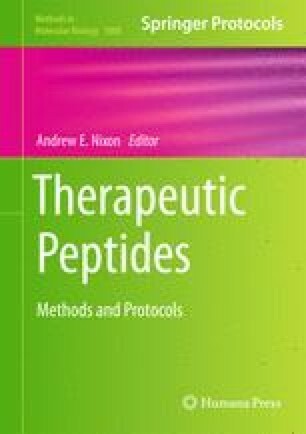 The success of finding a peptide with a desired property in a given library is highly dependent on the diversity and quality of the library. The protocols in this chapter describe the construction of a high-diversity library of phagemid vector encoding fusions of the phage coat protein pVIII with random peptides, from which a phage library displaying random peptides can be prepared. This work was performed at and supported by Medical Diagnostics Research, GE Healthcare.